When I first arrived in the United States in late 1970s, America had very different demographics. It was about 85% white. Most Americans with just a high school diploma enjoyed middle class living standards. They had good jobs in manufacturing industries like auto and steel. These jobs paid them well enough to buy a decent new home and drive late-model American-made cars. The US demographics and economy have both changed dramatically in the last four decades. 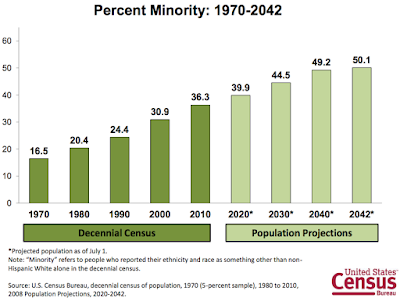 Minorities now account for about 30% of the US population. Low birth rate among whites and increasing immigration have both contributed to this reality. Meanwhile, unrelenting forces of globalization and continuing creative destruction have replaced the bulk of auto and steel manufacturing industries with new, high-tech industries. The high-tech sector in the United States is booming. It's creating a lot of new jobs. But most of these new jobs require at least a college degree and higher level skills, the kind of skills many middle-aged non-college-educated white Americans do not have. A combination economic and demographic changes has taken its greatest toll on middle-aged white Americans without college education. They are disillusioned and angry. And they are lashing out at the "establishment" politicians on both ends of the political spectrum, but mainly on the GOP side. Donald Trump has successfully exploited this anger by blaming immigrants, religious minorities and other nations for their problems. In a paper titled "Rising morbidity and mortality in midlife among white non-Hispanic Americans in the 21st century" published last year, Princeton economists Anne Case and Nobel Laureate Angus Deaton have shown that over the last 15 years, white middle-aged Americans have been dying at unusually high rates. Most of those deaths have been concentrated among people with only a high-school diploma, or less. 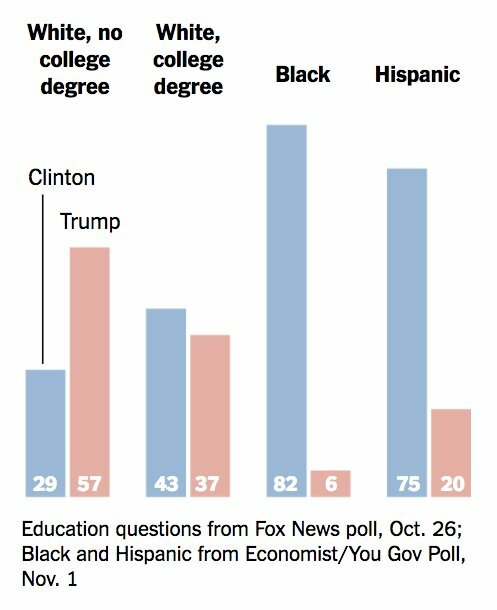 Polls say that these older, less-educated whites form the core pf support for Donald Trump. Will Trump Become the Next President? It appears unlikely given his support base. Here's why: John McCain and Mitt Romney, the last two Republican candidates since 2008, won the majority of white votes but failed to win the general election. Each of them got 60% of the 70% white votes that add up to 42% of the overall electorate. In addition, each of them got only 6% of Black votes and about 26% of the Asian and Hispanic votes that prevented them from gaining the overall majority needed to win. Trump's campaign rhetoric has managed to anger all minority groups, particularly Mexicans and Muslims. He will get even fewer minority votes than McCain and Romney polled in the last two general elections. Viewpoint From Overseas host Faraz Darvesh discusses the Trump Phenomenon with panelists Misbah Azam and Riaz Haq (www.riazhaq.com). Pakistan VIP Culture's Young Victim; Trump's Muslim Ban; PTI's Lodhran Win from WBT Productions on Vimeo. 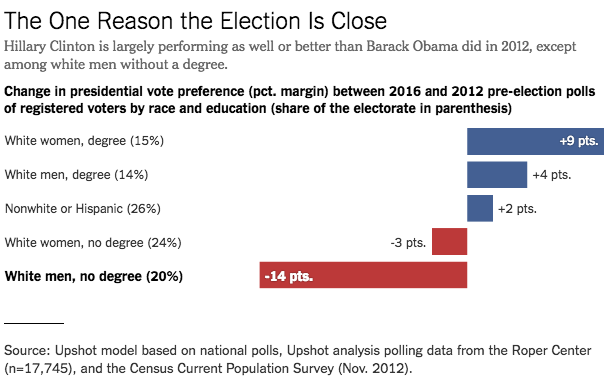 The Trump phenomenon appears to be linked to the changing US economy that has left many middle-aged non-college-educated white Americans behind. Like many other demagogues before him, Donald J. Trump is exploiting their deep dis-satisfaction and rising anger by blaming minorities and immigrants for their problems. 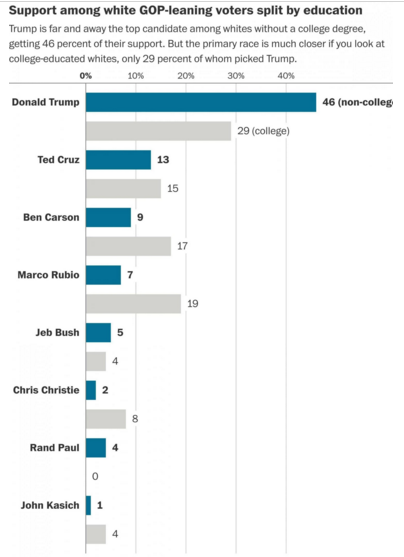 Even if Trump wins the Republican nomination, the chances of his success in 2016 general elections are remote. I think he is an idiot, but muslims have no one else to blame but themselves for rising anti muslim feelings. You think India is the only country which had enough of their nonsense. Ali: "You may enjoy reading this"
I agree with the author's conclusion and hope he/she's right. It is still more likely than not that Donald Trump will falter at some point in his quest for the White House. Hillary Clinton is still more likely to beat him than not in the general election. And there is a distinct possibility that a brokered Republican convention will lead to a third-party run by Trump if the party tries to install another nominee. This too will likely result in a Democratic victory. But the Democrats would do well not to take anything for granted, and begin looking for ways in which they can take down Trump, the Idea. The anger you are explaining is also attributed to the rise of Bernie Sanders. So looks like everyone is angry. BTW did you know that when Sanders won the primary at NH, he became the first non christian to ever win a caucus, let alone genera election. Suddenly US does not look that tolerant. Anon: "The anger you are explaining is also attributed to the rise of Bernie Sanders. So looks like everyone is angry." Yes, both Sanders and Trump are drawing anti-establishment vote in their respective primaries. However, Trump has never held elected office before while Bernie has been elected many times, first as mayor of Burlington, Vermont, and then as congressman and senator from Vermont many times. Trump has experience dealing with issues of public policy and governance; Trump does not. What I find even more amazing, however, are the Republican establishment’s delusions about what its own voters are for. You see, all indications are that the party elite imagines that base voters share its own faith in conservative principles, when that not only isn’t true, it never has been. Here’s an example: Last summer, back when Mr. Trump was just beginning his rise, he promised not to cut Social Security, and insiders like William Kristol gleefully declared that he was “willing to lose the primary to win the general.” In reality, however, Republican voters don’t at all share the elite’s enthusiasm for entitlement cuts — remember, George W. Bush’s attempt to privatize Social Security ran aground in the face of disapproval from Republicans as well as Democrats. Yet the Republican establishment still seems unable to understand that hardly any of its own voters, let alone the voters it would need to win in the general election, are committed to free-market, small-government ideology. Indeed, although Marco Rubio — the establishment’s last hope — has finally started to go after the front-runner, so far his attack seems to rest almost entirely on questioning the coiffed one’s ideological purity. Why does he imagine that voters care? Oh, and the G.O.P. establishment was also sure that Mr. Trump would pay a heavy price for asserting that we were misled into Iraq — evidently unaware just how widespread that (correct) belief is among Americans of all political persuasions. So what’s the source of this obliviousness? The answer, I’d suggest, is that in recent years — and, in fact, for the past couple of decades — becoming a conservative activist has actually been a low-risk, comfortable career choice. Most Republican officeholders hold safe seats, which they can count on keeping if they are sufficiently orthodox. Moreover, if they should stumble, they can fall back on “wingnut welfare,” the array of positions at right-wing media organizations, think tanks and so on that are always there for loyal spear carriers. Unless Bernie Sanders emerges to be the lead in Democratic party, unlikely there, I am voting for Donald Trump. It is not because I have been disenfranchised, or my job is now sitting in China, but because Trump makes sense. 1. If I had the option, I would shut down at least 80% of American mosques and arrest Mullahs there. They teach hatred for the Americans, which now includes your and my children. 2. Trump said, re. burgas: “They want to! What the hell are we getting involved for?” Same thing regarding the Middle East and the Islamic World - he wants the US to forget them and worry only about its own problems. 3. 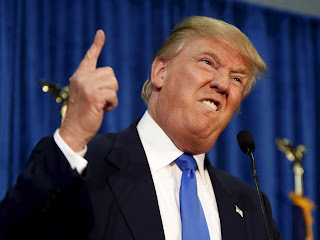 Trump knows how to run a business, and a government is a big business, which in the case of the US, a bankrupt business (Debt > Revenue and Liabilties > Tangible Assets and Current Income > Current Expense Obligations). 4. What Trump thinks is what Trump speaks, so we can dislike hime for what he says, but we know that we can trust that there is no hidden agenda there. My 2 cents. Want to hear what others have to say about this. Shams: "I am voting for Donald Trump"
A vote for Donald Trump is a vote for the lynch mob hysteria unleashed by his hateful rhetoric against Mexicans and Muslims. "His (Trump's) success is now providing affirmation and cover to his base of nativists and organized white supremacist groups. Such groups are connected to traditions of mob violence (consider the history of this country from the 1910s through the 1970s). This is why Trump’s suggestions that maybe protesters should be roughed up or punched are so loaded. This is the context in which to hear his celebration of false historical narratives about the use of “bullets dipped in pig’s blood” for the summary execution of Muslim adversaries. In the context of our very own history, Trump’s habit of condoning lawlessness is dangerous. When political leaders condone violence, their words are already doing things. They provide cover, embolden and enable." BTW One Of The Financers of Jeb Bush Is A Wall Street Investor Muneer Sattar.Is He A Pakistani???? They set a new record. I watched the Republican debate on CNN and could not believe what I was witnessing! The whole world is watching. We have been turned into a laughing stock. Plus most people don't know why it takes more than a year to elect a president in the US. Ahmad: "I watched the Republican debate on CNN and could not believe what I was witnessing! " Are these "white trash" equivalent of "internet hindus" who support Modi. Mr. Haq thanks for coming out of the closest and proving that you are a confirmed islamists. And of course you will never admit that muslims can do any wrong. How can that be, right ? I support Donald Trump because there is no better choice. Despite being a Jew I will not vote for Dem this time (historically jews have voted 70% to Dem). DR: "I support Donald Trump because there is no better choice. " I agree with President Obama's assessment that he made recently as follows: "I continue to believe Mr. Trump will not be president. And the reason is that I have a lot of faith in the American people. Being president is a serious job. It's not hosting a talk show, or a reality show." If the majority of Americans do elect a vulgar demagogue like Trump president, it will amount to cutting off your nose to spite your face. Former CIA director Michael Hayden believes there is a legitimate possibility that the U.S. military would refuse to follow orders given by Donald Trump if the Republican front-runner becomes president and decides to make good on certain campaign pledges. Hayden, who also headed the National Security Agency from 1999 to 2005, made the provocative statement on Friday during an appearance on HBO’s “Real Time with Bill Maher.” Trump, fresh off a string of primary victories, has yet to secure his party’s nomination, but Hayden said the candidate’s rhetoric already raises troubling questions. “I would be incredibly concerned if a President Trump governed in a way that was consistent with the language that candidate Trump expressed during the campaign,” Hayden said during the interview with Maher. The New York billionaire has heard similar comments about his hands or, more precisely, his fingers, for years. As Vanity Fair's Graydon Carter recalled online last year: "Just to drive him a little bit crazy, I took to referring to him as a 'short-fingered vulgarian' in the pages of Spy magazine. That was more than a quarter of a century ago." It turns out Trump put out meat provided by local wholesale meat supplier Bush Brothers who source their beef from Creekstone Farms, one of the nation’s leading producers of high-quality beef (the best 1%, which would be appropriate for Trump’s brand). But aside from being premium beef, Creekstone Farms beef (much to the delight of Muslim foodies everywhere) is certified Halal! A top aide to Senator Marco Rubio on Friday urged his supporters in Ohio to back Gov. John Kasich in that state’s primary on Tuesday, giving fresh momentum to efforts to stop Donald J. Trump a day after a debate in which his rivals declined to take a swing at the leading Republican presidential candidate. Alex Conant, Mr. Rubio’s spokesman, made the comments in an interview with CNN. He said that he hoped supporters of Mr. Kasich and of Senator Ted Cruz would support Mr. Rubio in his home state primary in Florida, and that he would suggest Mr. Rubio’s backers in Ohio do the same by supporting Mr. Kasich there. He said the reverse was true in Mr. Rubio’s home state, suggesting that supporters of Mr. Kasich and Mr. Cruz back Mr. Rubio there. The remarks dovetail with a strategy proposed by Mitt Romney, the party’s 2012 nominee, who urged Republicans opposing Mr. Trump to coalesce around the leading non-Trump candidate in coming nominating contests to deny the nomination to the Manhattan businessman. In a news conference in West Palm Beach, Mr. Rubio echoed the sentiment, but did not go as far in urging his supporters to back Mr. Kasich in Ohio. And Mr. Cruz, speaking in Orlando on Friday, dismissed the strategy, indulging in a laugh when asked about it. Mr. Cruz argued, as he has for weeks, that he was the only candidate still capable of doing so. Those hoping to defeat Mr. Trump acknowledge that if he wins either Ohio or Florida, it becomes much harder to deny him the nomination. Mr Trump has called for a "big big wall" to be built on the US-Mexican border, paid for by Mexico, to keep its illegal immigrants and drug dealers out of the United States. A Christian pastor in the nation’s third-most-populous county tried to stop a Muslim man from serving in the local Republican Party because of his religion. The massive jurisdiction of Harris County, Tex. — with 4 million residents in the city of Houston and its surroundings — has more than 1,000 precincts, and the Republican Party appoints a chair for every single one. Approving the people picked by a committee to fill some of those spots should have been a run-of-the-mill task. But Trebor Gordon stood up at a meeting of the county’s GOP on Monday night. He said that Syed Ali — a 62-year-old Houston resident who has been a loyal Republican since the Reagan administration — should not be appointed. “Islam and Christianity do not mix,” Gordon said. Party chairman Paul Simpson said that Gordon serves as chaplain for the Harris County Republican Party and is a part-time pastor at a Houston-area church. Seeing her party chaplain make such a motion, precinct chair Felicia Winfree Cravens said she was stunned. “There were more shocked faces in that room than you could count,” she said. Cravens’s camera happened to be rolling — she said she was showing a friend how to use the new Facebook Live tool, so she was broadcasting the otherwise humdrum party meeting. Suddenly, she found herself capturing the discussion of Ali’s religion on tape. The Houston area has more Muslim residents than most other parts of the United States. More than 1 percent of the city’s residents are Muslim, and the city has more than 80 mosques and at least 10 Muslim schools, according to the Houston Chronicle. The debate over the motion was brief but contentious. One man brought up the party’s rules prohibiting discrimination on the basis of religion. That prompted another man, identified by Simpson and Cravens as precinct chair Mike Robertson, to stand up to ask whether Islam is a religion at all. Cravens said that as someone active in Republican politics, she is seeing much more anti-Muslim sentiment in her Facebook feed lately, in conjunction with the rise of Donald Trump. “If there were a hashtag more intense than #NeverTrump, I would be it,” she said. According to Hipmunk, bookings at Trump Hotels plummeted 59 percent during the first half of 2016 and data from Foursquare shows a 17 percent drop in foot traffic at Trump properties since June 2015, when the reality TV star announced his presidential bid.